The history of lenticular is intriguing to those fascinated by its complex, yet simple, concept. It is known as the process or combination of two or more images viewed by a specialized lens material to create the illusion of animation or three-dimension. Earliest forms of this technology is said to have been discovered and applied back in the early 1900's. Through the years, many have explored and tested this original formula with the use of barrier screens and camera lenses. Still today, the concept of lenticular is ever-changing. New technology continues to bring us great advancements in design capabilities, software, printing possibilities, and the lenticular lenses themselves. This lenticular history is further detailed within this section through the research of author David E. Robert. An autostereoscopic display presents a three-dimensional image to a viewer without the need for special glasses or other impediments (hence "auto" stereo). The first autostereoscopic method to appear was the "barrier" technique, which involved dividing two or more pictures into "stripes" and aligning them behind a series of vertically aligned "opaque bars" of the same frequency. It was first proposed and demonstrated by the French painter G. A. Bois-Clair in 1692. As a viewer walked by his paintings, they would appear to change from one picture to another. The barrier technique was later proposed using photographic methods independently by both Jacobson and Berthier around 1896. It was first applied by Frederick E. Ives of the U.S. in 1903 and later by Estenave of France in 1906. Coined the "Parallax Stereogram" by Ives, it was essentially a stereo viewing aid placed on the picture instead of at the eyes. Besides the Parallax Stereogram, Frederick E. Ives (1856-1937) is also credited for inventing novel approaches to color photography, color "moving" pictures, and the half-tone process that made the publication of photographs in newspapers and magazines possible. Figure 1. The Parallax Stereogram, as patented by Fredrick E. Ives in 1903. The Parallax Stereogram (Figure 1 and 2.) was made up of three elements: (1) a barrier-masking screen, which consisted of vertical opaque lines, separated by clear slits of lesser width. (2) A transparent glass plate behind the barrier screen which created spacing between it and (3) the photographic emulsion that consisted of the picture information divided into fine mosaic image stripes aligned behind each clear aperture. They were made by separately projecting the left and right-eye stereo views through the barrier screen, from precise angles, so as to divide them into narrow vertical image stripes positioned alternately side by side. When the photographic plate was developed and reinstated behind the same barrier screen, the viewer's left-eye would see only the left-eye mosaic stripes and the right-eye would see only the right-eye stripes (see Figure 3). If a fine pitched barrier screen is used, the screen becomes nearly transparent and each eye would see its own corresponding image stripes as a whole composite image, thus receiving the two dissimilar views necessary to realize a three-dimensional impression. Researchers at the Soviet Motion Picture and Photography Research Institute (NIKFI), including S.P. Ivanof, further investigated the concept in the early forties. They constructed a large radial, non-parallel-type barrier screen to project "parallax stereogram" motion pictures. The screen reportedly weighed several tons and required a dedicated theater with specially positioned seating to view. The fact that the stereo image could only be viewed correctly from a narrow viewing "zone" was the fundamental drawback of parallax stereograms. Excessive side-to-side movement of the head outside the zone would cause the left and right eye views to be switched and be seen by the inappropriate eye. The result of which was a pseudoscopic image where the depth is inverted (foreground appears to be the background and vice versa). This problem of pseudoscopic zones was resolved for the most part by adding multiple views beyond the two stereo views for a wider range of viewing. This adds a "look around" capability, where the picture moves through a sequence of stereo views as the viewer moves from side to side, revealing different aspects of an object or scene. Figure 4. C.W. Kanolt's Parallax Panoramagram Camera as patented in 1918. The first method allowing multiple views behind a barrier screen was proposed in January 1915 by Clarence W. Kanolt in his U. S. Patent 1,260,682 issued in 1918 which incorporated a large format camera (Figure 4) which moved the barrier screen between exposures. Kanolt coined the term Parallax Panoramagram to describe his images with multiple stereo views. He also suggested using the camera to create animation. The technique was greatly advanced by the son of Fredrick E. Ives, Herbert E. Ives (1882-1953). He was the first to create images using a large aperture camera lens (a lens with a diameter wider than the interocular distance). His first camera housed a 12" diameter- f2 lens (Figure 5). This permitted an "infinite" or continuous set of views, the resolution of which was defined by the width of the clear line relative to the opaque line in the barrier screen, to enter the camera in one exposure, allowing for human and other moving subjects to be photographed "instantly". Since the parallax panoramagram records only horizontal parallax information, most of the light rays entering the camera through the large round lens were useless. Ives was aware of this and later replaced the large lens with a single small lens similar to an ordinary camera lens, which scanned from left to right in front of the barrier screen, a distance equal to or greater than what was the diameter of the large lens. This technique gave rise to a variety of "scanning" camera systems, which are still in use today. The major contributors to such systems included Douglas Winnek of the U.S. and Prof. Marrice Bonnet of France. These are generally known as scan cameras or Bonnet-style cameras. Ives also experimented with fixed and scanning concave mirrors (Figure 6), multiple camera systems (up to fifty at a time), and autostereoscopic movies and other techniques into the early 1940's. A well-respected physicist, Herbert Ives is perhaps best known as a pioneer of early television with his groundbreaking work at Bell Labs. By the time of his retirement in 1947, Ives had published more than 200 papers, and secured more than 100 patents. Parallax barriers became a dramatic tool of advertisers in the 1990's, available through a variety of specialized companies. Stunning large format images developed by Grayson Marshall became well known at airports and New York bus shelters. Some remarkable computer generated barriers (called Pshcolograms TM ) were created by (Art) n laboratories in Chicago, which were displayed in science museums and art galleries throughout the world. However, with the advent of readily available lenticular display screens, the parallax barrier methods have all but disappeared, for now. On March 3rd , 1908, physicist Professor Gabriel M. Lippmann (1845-1921) proposed the use of a series of lenses at the picture surface instead of opaque barrier lines. He announced this to the French Academy of Sciences under the title "La Photographie Integral". He was able to record a complete spatial image with parallax in all directions. The process utilized an array of small spherical lenses, known as a fly's-eye lens array (a screen that consisted of a tremendous number of small convex lenses), to both record and playback the image. Lippmann, truly a man before his time, was best known for his invention of the photographic reproduction of true color in 1886. The colors were reproduced by recording standing waves formed within an emulsion layer by the interference of direct and reflected light. He was awarded the Nobel Prize for the invention in 1908. The invention was, ironically, in essence the first holographic method. A number of researchers continued to advance the process of Integral Photography over the last 30 years including, most prominently; Roger de Montebello, Lesley Dudley and Robert Collier of the US, Neil Davis and Malcolm McCormick of the U.K. and Yu. A. Dudnikov and B. K.Rozhkov of the former Soviet Union. Creating 3D integral imagery, by digitally interlacing a mulplicity of computer generated two-dimensional views, was first demonstrated in 1978 by Yutaka Igarashi, Hiroshi Murata and Mitsuhiro of Japan. They and others also developed experimental integral television methods. Digitally interlacing integral imagery for high-resolution color pictures was first proposed in 1990. Thousands of experimental images have been produced by a variety of methods exhibiting 3D, animation and other effects over the years. Although Integral imagery has not yet achieved significant commercial success, its use is inevitable and holds great promise as being a very unique display medium. In the late 1920's, several scientists, including Herbert Ives, began to consider simplifying Lippmann's integral (fly's-eye) lens array by incorporating a lenticular lens array. A lenticular lens sheet consists of a linear array of thick plano-convex cylindrical lenses, known individually as "lenticules". The lens sheet is transparent and the rear face, which constitutes the focal plane, is flat. A big advantage was it was optically analogous to the parallax barrier screen, and could therefore draw on a wealth of barrier screen research. In the 1930's many researchers worked on advancing the technology. There was the British "Lenticulated screen" process, the French method of Josse, and the German "Diacor" method. Ives also attained considerable practical success. When a lenticular array is coated with a film emulsion at its focal plane and exposed to light rays from a particular angle, once developed it will redirect the light rays in the same approximate direction as the recording angle. This unique property found its first successful commercial application not as a tool for 3D photography but as a means for producing color motion picture film as the original Kodak Kodacolor process introduced in 1928. Instead of individual stereo images being exposed behind the lenticular screen, individual stripe images relating to red, green, and blue aspects of a single view were recorded and re-combined through a special projection system into a full color image using only black and white emulsion (Figure 13). The process, using a very thin and fine screen of 600 lenses per inch on 16 millimeter film, ran for a number of years with considerable success, and the Eastman Kodak company as recently as 1951 was offering an improved version for the 35mm format. 3D lenticular photography was later greatly advanced by Professor Maurice Bonnet of France, and Doug Winnek and Victor Anderson of the U.S. Professor Bonnet developed a number of patented camera designs and imaging techniques including electron microscope imaging, amongst many others. His cameras became so widely recognized that most scanning lens cameras are still referred to as a "Bonnet-Style Cameras". Douglas Winnek also was quite prolific in patented camera designs, imaging techniques and lens manufacturing methods (Figure 15 through 17). Called "Trivision", his inventions were widely publicized including his approach to auto stereoscopic X-ray photography. Lenticular techniques showed rapid progress in the 1960's as large corporations recognized its advertising potential. Mass production became a reality on February 25, 1964, when a Look Magazine issue featured the "first ink-printed postcard sized "parallax panoramagram". The black and white still life of the bust of Thomas Edison surrounded by some of his more famous inventions required a 1000-pound camera, tracked in a programmed arc, to photograph. The manufacturing process involved printing the image using a 300 line offset press and a special technique for coating and lenticulating a thin layer of plastic on the image at high speed. The process, known as "Xograph" was developed at Eastman Kodak in Tennessee and was credited to Arthur Rothstein and Marvin Whatmore. Over 8 million copies were sold. Look Magazine followed with a color lenticular on April 7, 1964. With the growth in the popularity of lenticular in the 1960's, several companies entered the market including Vari-Vue of New York, which was co-founded by Victor Anderson, who contributed greatly to the practical commercial success of the product. Vari-Vue, along with companies such as Crowle Communications, Hallmark, Toppan ("Top Stereo") and Dai-Nippon of Japan and later Optigraphics ("Optipan" and "Linearoptics"), produced a wide variety of products over the next twenty years, including Cracker Jack premiums, Political buttons, 3D baseball cards, postcards, magazine and book covers and point-of-purchase displays. By the 1980's, as the novelty value of lenticular wore thin, the only significant manufacturer left in the US was Optigraphics who's success was largely the result of the continued technical expertise of Victor Anderson. Up to this point, the few companies that produced lenticular products used "proprietary" methods with lenticular screens manufactured only for their internal use. Most of the screens used for lithographic reproduction were heat embossed in PVC. Display lenses were typically injection molded and therefore limited in size. Some non-exclusive lenticular screens were available for experimentation, but were very expensive. For example, large thick lens materials were being produced for sale by Bernard Jéquier of Switzerland in almost any configuration, but were tooled directly in the plastic and were therefore all one-of-a-kind's. In the early eighties consumer multi-lens cameras were introduced. The negatives produced from such cameras where sent away to be processed into lenticular prints. The first system to appear was the four-lens Nimslo camera and processing center developed by Alan Lo and Jerry Nims. Nimslo first mass-produced the fine-line lenticular material required for their process at Rexham in North Carolina. In the late 80's, personal computers became commonplace in the graphic arts industry with the advent of adequate speed, memory and software. This moved the lenticular creation process rapidly from the proprietary in-house photomechanical domain into the hands of many creative and proficient computer artists with a general understanding of the process. This combined with readily available lenticular sheets created a renewed interest in the product as an effective advertising tool. For the first time, any ambitious printer that desired to print lenticular now had the means. The market for reverse printed lenticular sheet just about doubled every year in the next five years. Figure 19. 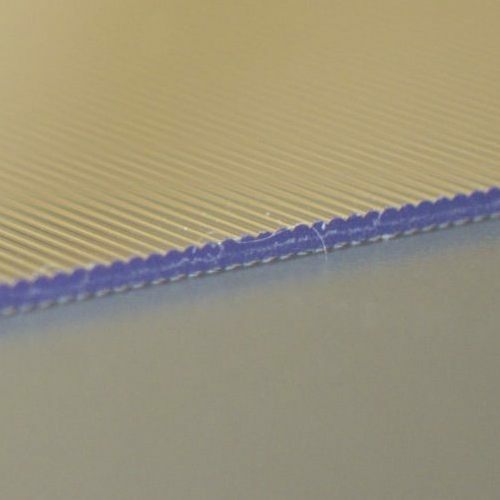 A modern extruded lenticular lens profile. Today, lenticular lens material has come a long way. There are specific lens designs for animation, 3D and large formats. Combine the new lens technology with greater imaging and print resolutions, and the results are truly amazing. Lenticular printing is seeing a rebirth again, with numerous applications, fueling a hundred-year-old industry that continues to captivate, develop and grow. I believe a complete factual history of lenticular and related autostereographic methods is both useful and important to those who continue to contribute to this industry. This is only a brief version, written for the Internet, of a more extensive text being written for later publication. If you have or know of any information, stories or images you would like to see included, or find any inaccuracies or important omissions in this text, please contact me at info@leaptechnologies.net. Boltiansky, A. G., and Ovsiannikova, N. A., Stereoscopic Cinematography in the Soviet Pavilion at the Expo-70, Cine-Technology and Television (in Russian), 22-27 (Oct. 1970). E. T., Formation and Inversion of Pseudoscopic Images, Appl. Opt. 7, No.3, 627-631 (March 1968). Burckhardt, C. B., and Doherty, E. T., Beaded Plate Recording of Integral Photographs, Appl. Opt. 8, No. 11, 2329-2331 (Nov. 1976). Chamberlin, G. R., The Characterization of Lenticular Sheets and Parallax Barriers for S.D Imaging. Proc. Collender, R. B., The Stereoptip1exer, J. Soc. Photo-opt. Instrum. Eng. 6, No.1, 14-18 (Oct./Nov. 1967). Collender, R. B., The Stereoscopic Movie System Without Glasses, Information Display, 23-30 (Sept./Oct. 1968). DeMontebello, R. L., U.S. Patent, 3,503,315 (1970). Ives, F. E., U.S. Patent, 666,424 (1901). Ives, F. E., U.S. Patent, 725,567 (1903).